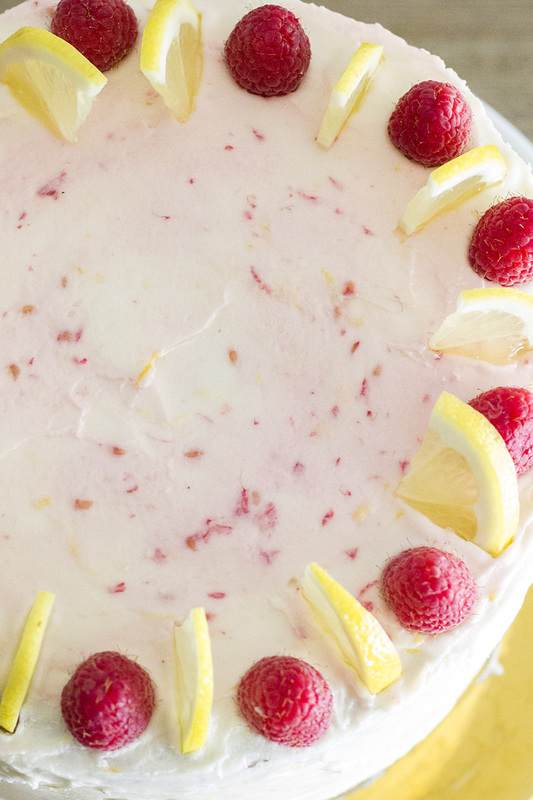 This gorgeous Lemon Raspberry Cake is a dessert lovers dream! 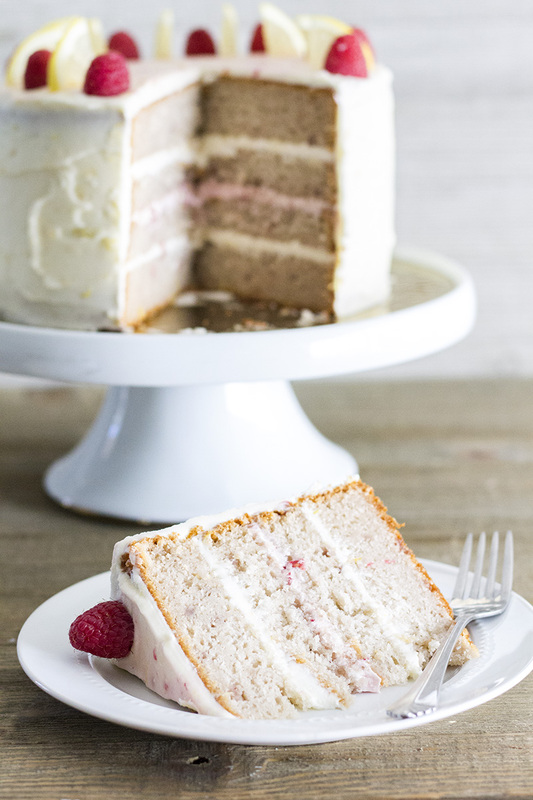 Layers of raspberry cake marry with lemon buttercream for an out of this world dessert! There’s something really special about layer cakes. Maybe it’s the layer after layer of delicious cake, filling, and frosting or the simple fact that you know it was made with some serious love. Either way, big fancy cakes are one of my favorite desserts to indulge in. Normally, I save my layer cake for when we go out to eat. 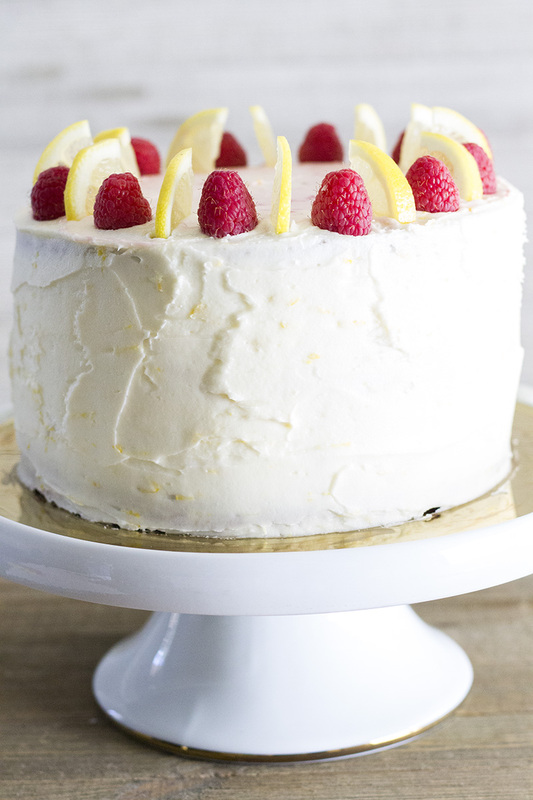 But today I’ve decided to go big or go home with a Raspberry Lemon Layer Cake that’s surprisingly easy to make and will my you the star of any dinner table. Lemon is my default spring dessert flavor. It’s bright, happy, and yellow is such a fun food color! While I love a straight up lemon dessert, today I’m having some fun with a classic flavor combination – raspberry and lemon. 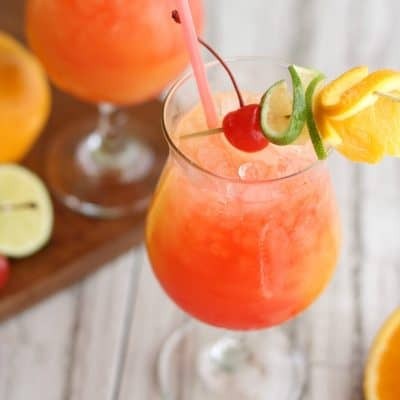 They’re two peas in the pod and the resulting drink or dessert is always epic. So is this cake. Outside, you get a classic cake look with a little fresh fruit for garnish. 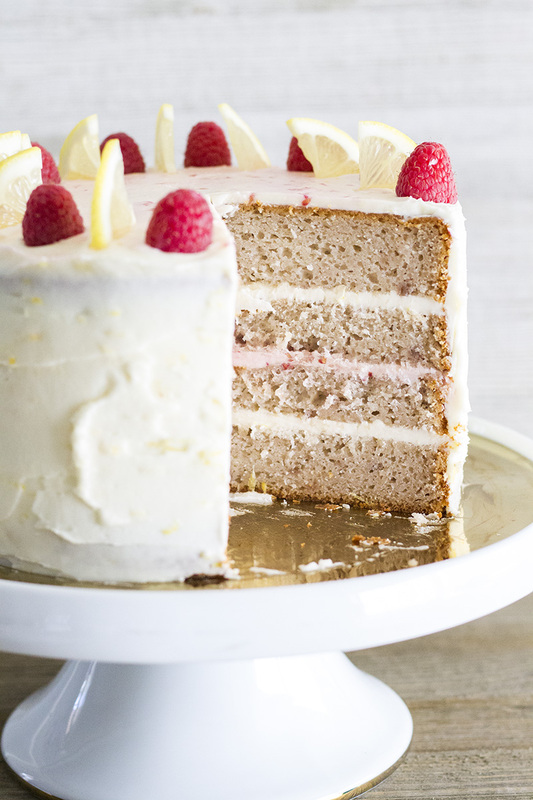 Inside it is layer after layer of raspberry cake with lemon and raspberry buttercream for a decadent dessert that’s made for spring…but you’ll want to eat it all year long. Trust me. If you’re crazy about lemon too, you’re in luck. This month for feast & devour it’s all about lemon! 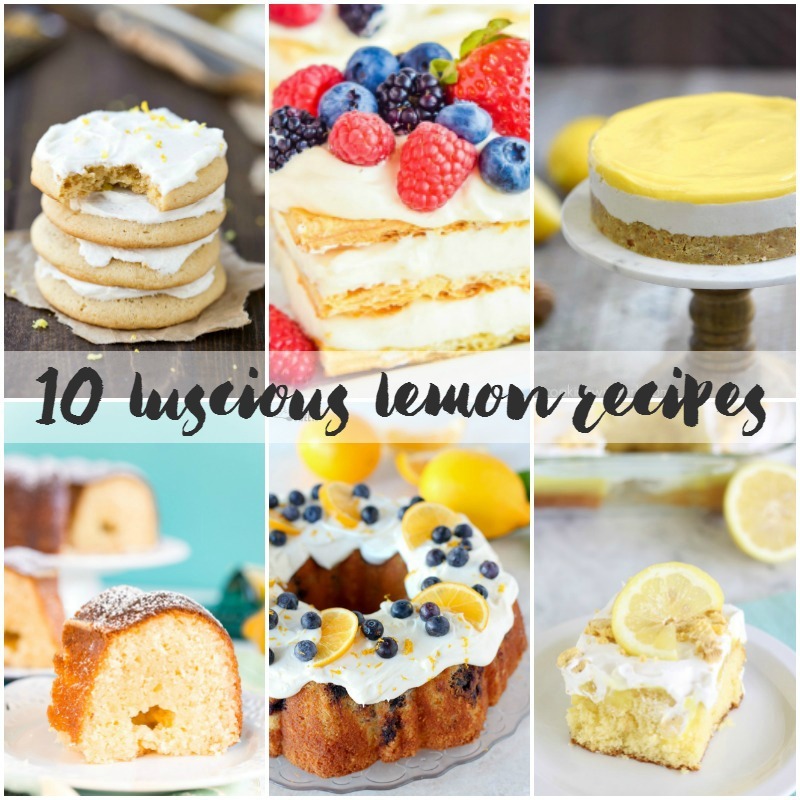 Below you’ll find 10 killer lemon recipes to satisfy your cravings. 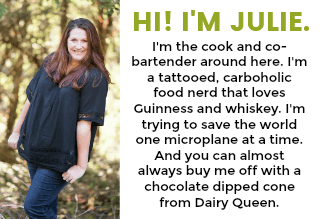 Just click each link to be taken to the full printable recipe and get your dessert on! Preheat your oven to 350 degrees F. Grease and flour two high-sided 8-inch cake pans. Set aside. In a large mixing bowl, whisk together one box of cake mix, 1 1/4 cups milk, 1/3 cup oil, 3 egg whites, and 1/4 cup raspberry jam until evenly combined and smooth. Pour the batter into one of the prepared pans. Repeat with the remaining cake ingredients. Bake the cakes for 50 to 55 minutes, or until a toothpick inserted in the center comes out clean. Don't worry if the centers sink a bit (mine did), we're going to level the cakes later anyway. Remove the cakes from the oven and allow to cool completely in the pans, on a wire rack. In a large mixing bowl, beat together all of the butter and 1/2 pound of the powdered sugar until smooth. Add in another 1/2 pound of sugar, and mix until combined and smooth. Repeat with the remaining sugar. Add vanilla and mix to combine. Add 1 tablespoon of milk, if needed to reach your desired consistency, and mix to combine. Add more milk as needed. Continue to mix frosting for 1 to 2 more minutes until fluffy. Place 1/4 of the frosting in a separate bowl. To this smaller amount of frosting add the fresh raspberries and use a spoon to mix until the frosting in pink and the raspberries are fully incorporated. To the rest of the frosting (the other 3/4) add the lemon zest and lemon juice. Mix to combine until the lemon is easily incorporated. Use a sharp knife or cake leveler to level the top of each cake. Then cut each cake in half horizontally so you have a total of 4 layers. Spread a dollop of lemon frosting in the center of a cake plate. Place one cake layer in the center of the cake plate. This layer should be the bottom of one of the cakes. Top this cake layer with a generous amount of lemon frosting. Place one of the "top half" layers of cake on the frosting and top this cake layer with a generous amount of raspberry frosting. (Don't use all of it, save a little.) Place another "top half" layer of cake on top of the frosting and top this cake with a generous amount of lemon frosting. Place the final layer of cake on top. This should be the other bottom half cake layer, and you'll want to flip the cake over so the bottom is up and the cut side is touching the frosting. This will help give the top of your cake good lines. Frost the entire outside of the cake with a thin layer of lemon frosting. This creates a crumb coat and lets you even out any weird areas on the cake. Refrigerate the cake for 30 minutes to 1 hour. Remove the cake from the fridge and frost the entire cake with lemon frosting. Once you're done, use an offset spatula to swirl some of the raspberry frosting in with the lemon frosting on the top of the cake. To decorate, place 12 fresh raspberries in even intervals around the top edge of the cake. (Space them like the hours on a clock.) In between each raspberry place a lemon wedge standing on one edge. Refrigerate until ready to serve. To make sure your cakes come out of the pan whole, and on the first try, I use this Miracle Pan Release anytime I bake a cake. To help the lemons stand up, cut 1/4-inch thick lemon slices and then cut each slice into quarters.